Hi all! This is my first thread here. It's been great being able to have access to all the information and expertise contained in the community. Thanks to all the members who I have learned from. I am the proud owner of three pairs of Klipsch speakers. Quartets, earlier Heresy ii and Tangent 500. The Quartets and Tangent 500s have upgraded crossover capacitors. The Quartets have Crites titanium tweeter diaphragms. 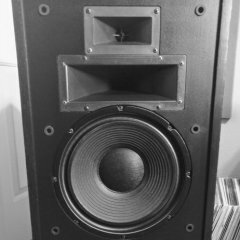 The Tangent 500s have had their cabs extensively braced and dampened so that they are very quiet and well damped. The Heresy ii are stock. I find that the Heresy ii are my favourite. This is because the other two pairs both have an odd thickness to vocals, especially female vocals, that makes them sound as though there is an emphasis on the deeper notes of all vocals. It's a subtle, but noticeable emphasis on the lower midrange that sounds unnatural and is distracting. Crossover upgrades were done with higher quality caps of the same values, and they had this problem before and after the cap upgrades. I'm wondering if this is something that anyone else has noticed, and if there is anything that I can change in the crossover or elsewhere that might solve this issue. I use mostly my own DIY single ended tube amps to power the speakers. Any advice of recommendations would be appreciated. I love my klipsch pro media 2.1 so much that i decided to make them even better. For me these are the best computer speakers i can afford. I did these mods over several months, buying most parts from eBay (it takes 2 to 4 weeks to arrive from china). The most expensive parts were the control pod box (10 US$), the bluetooth receiver (7$) and the relay (8$). The other parts were between a few cents and 3 dollars). I am very satisfied with the result. As can be seen in the pictures, i completely detached the control pod from the speakers (because i had to move the speakers away from the computer), added some good quality gold plated binding posts, replaced the cables, added an on/off switch and a relay to the sub woofer so that the speakers automatically switch on and off with the computer. A 12 volts signal from the computer PSU controls the relay. I added a bluetooth receiver inside the control pod. On the front picture of the pod one can see an on/on input selection switch (select between the computer speakers and bluetooth reception from my iphone and ipad) and a blue led light in-between the 2 volume knobs. On the back of the pod is the power input for the bluetooth receiver (5 volts supplied by the computer PSU), the bluetooth antenna connector and the bluetooth on/off switch. I did not alter in any way the original klipsch circuitry. I did not want to power the bluetooth from the control pod circuitry as i was afraid to alter the sound quality.